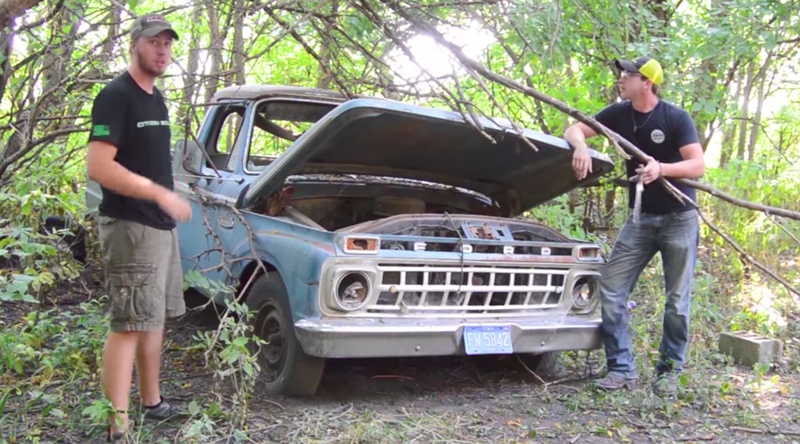 Two guys in Iowa found a 1965 Ford F-250 that had been abandoned in the woods since 1991. The video series showing how they got the dilapidated pile of junk running and driving is totally captivating. I’ve always been a fan of Roadkill, because compared to a lot of other Car Build-type shows, it always seemed the most relatable. It was just two guys with a small budget and a prayer—it’s a formula that works. I think when it comes to shows like that, the jankier the vehicle and the lower the budget, the more exciting it is to watch. That’s why when I came across a video series by an Iowa-based YouTuber named Junkyard Digs showing two ordinary guys resuscitate an abandoned 1965 Ford F-250's FE-Series V8 engine going, I couldn’t help but to get sucked in. Here’s the first episode, which shows the two gentlemen meeting their new project for the first time, and trying to get that engine to turn over by hand. The finale of the series is hilarious; the two determined truck-resurrectors try starting the Ford in gear, but this just propels the vehicle forward with the starter without actually getting the engine to fire. The duo’s solution? Jack up the rear end so the engine can start in gear without all the drag of the truck, then drop the F-250 back down on its wheels. The whole series is deeply entertaining, and actually very informative, as the hosts explain what they’re doing along the way. They tell us how a power valve in a carburetor works, what exactly is causing issues with the engine’s valve timing, how to use a piece of old radiator hose to make a large hose fit onto a small radiator port, and little things like why you might want to use gasket maker on a pitted thermostat outlet. It’s the most entertaining car-related video series I’ve seen in a long time, though I’ll admit that may have something to do with my affinity for bringing junkers back to life.